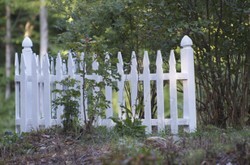 Back in the day, statistics indicated that lots of us dreamed about owning our own "white picket fence". Did you? It took over 1/2 a century for me to get my own. For some people, the white picket fence, 2.5 children and a dog depicts a traditional type of lifestyle. Perhaps just by saying that I am dating myself, but this was a true dream of mine. A few years ago, I was interviewed about a website my sisters and I had built. One of the questions they asked was about my dreams as a young person. Simple, straightforward and honest - my dream as far back as I can remember was to become "the good wife". Shortly thereafter a great mom. Eventually my goal was to be the best grandmother ever. I'm think perhaps that answer was too simplistic for their purposes because they were never revealed. © Duchess O’Blunt, 2012; all rights reserved. © All photographs in this hub are the property of the Duchess O'Blunt. You could say I wanted to be one of the typical statistics. There were thousands of young girls who wanted the same things, at least it seemed that way when I was young. Although I could be forgiven for forgetting a thing or two now and then. It seemed a very difficult thing for me to have 2.5 children, so I settled for two. Stat's showed one boy one girl - I preferred boys. I wasn't too thrilled about having a "mini me" running around. Fortunately we had two boys. We never had a dog, and I was past the 50 mark before I got the white picket fence. Even then it was just a corner to show off a few flowering bushes. The kids grew up on us. Imagine! Adjusting to an empty nest takes some time, but we all manage. The big house where our kids grew up sure seemed empty with them gone. The rooms seemed to echo where before they were just noisy. The neighbourhood didn't even look the same. Our lives where changing, the nest was empty, and we didn't have to plan around the kids schedules. It seemed a natural progress to consider about getting that place in the country we had dreamed about. After much thought, we made the decision to sell our family home in the city, and buy a home with some property in the country. Now that is a major lifestyle change. In fact I think it worthy of its own article: Country Living - Is it Right For You? This has provided another learning curve. I'm not a gardener, but once we moved in and started clearing out the forest that had been allowed to move in, we discovered amongst other things, some rock gardens. I am currently on a mission to learn something about gardening. In the meantime, I have been pretty ruthless about pulling things out of there that look like they don't belong. The result looks good to my eyes, but what the heck do I know? As a result of all that weeding, we were able see the white picket fence. Only it wasn't so white. As it turns out, my "White Picket Fence" is a bugger to keep white! Like everything else I do, I am a messy painter. One reason the hubby does the inside work and leaves the outside painting for me. We got out an entire gallon of white paint, he made sure I wore some raggedy old clothes and left me to it. I managed to cover a few years of neglect on those old wooden fence posts, as well as the ground around them, and myself - pretty much from head to foot. Getting my white picket fence was quite an accomplishment. Life has a way of happening when you are not looking, and long before you expect it, you are looking back on the big 50. For some that's a crises. For me it was a time for reflection. I called it my mid-life reflection. After wasting some very valuable time on those reflections, it was time to move on. Life continues to happen, and let's face it, at this age, you can't afford to waste too much time on reflection. Photography has come a long way since my first 35mm camera. I bought that camera in good faith - expecting to learn how to use it and to go on to become a world famous photographer. As I said, life has a way of happening. The children were more important than my camera. The cost of learning with film was beyond me at the time. But now I have the time and the world has gone digital. Now I have a good camera and now I can occasionally find the time to to be an enthusiastic hobbyist. But what a learning curve, and what fun! I took some time to research before I made the investment of a camera. My camera of choice was a Nikon D7000. Love it! I call myself an enthusiastic hobbyist, and if that's all that ever comes of it, I'm ok with that. When our children left to start families of their own, another part of my lifelong dream came to fruition. I saw a post on Facebook that pretty much sums it up. "Something magical happens when you become a grandmother". Remember the last of my 3 major life-long goals? To become a grandmother. Well, it has finally happened. There is nothing that compares to holding him, to watching him grow. So here I am, enjoying my golden years, and finally that white picket fence. I am one of the lucky ones and have watched those ambitious dreams of mine unfold, AND the grey matter is still functioning well enough for me to be able to recognize it. Now perhaps I'll take up writing again. © Copyright to this article and photographs on Wizzley is owned by the Duchess O’Blunt and may not be copied without express permission from the writer. Payment for use of any photographs or articles written by the Duchess O’Blunt is by negotiation. Thank you for taking the time to let me know you have read my blog. Some things most assuredly do stay the same! It's fascinating how we change and evolve over time. Yet some core things remain the same.